A practice journal allows you to track your practicing. You can use whatever method to track your practice. Choose a method that works for you. If your practice journal doesn’t fit your needs, you will be less inclined to use it. You can track the amount of time, what you practice, or a combination of both. This post will help you decide whether or not you need a practice journal and how to create one that suits your needs. Why Use a Practice Journal? If you want to track your practice for any reason, you should use a practice journal. Writing things down makes it much easier to remember them. Our minds are fascinating, but they can’t keep track of everything. A practice journal is a specific notebook or journal you use to track your practice. It is separate from planners and other notebooks. You can keep in on your music stand or by your instrument case, so you remember to use it. One of the biggest benefits of tracking your practice is seeing how you’ve grown. After you’ve used a practice journal for awhile, you can go back to when you first started and see how far you’ve come. Seeing your growth, on paper or through recordings too, can be incredibly motivating to keep practicing. Also, if you have a lot of music to work on, a practice journal can help you organize everything. Track the days you practice a certain piece, and you can use that information to plan future practice sessions. There are two main things you can track in a practice journal: time and progress. If you work best by tracking time, then your practice journal can be a time log. However, if you’re like me, tracking the time might make you anxious. A few years, I used a music practice app. I can’t remember the name of the app, but it allowed me to create different sections of practice, like tone, technique, etc. Well, the main way it tracked my practice was by timing me. I basically had to set time based goals, and that didn’t work for me. In order to meet a time goal, I would usually end up fooling around for the later part of my practice. This time around, I’m tracking what I practice each day as well as what I accomplished or learned that day. I have found that system works much better for me. Since I’m preparing for masters auditions and have a lot to work on, I can track what I practice each day. That way, I can go back the next day and see what might need more attention (i.e. the pieces I haven’t practiced in the last few days). I use a simple notebook that I got at CVS to track my practice. Each month, I make a new “section” in the journal. The first page has all of my goals for the month. Then I have a calendar page which includes all of my rehearsals and performances that month. Next is my practice tracker. At the top of the page, I wrote the days of the month. On the left side is all of the categories I want to track that month. The categories could be exercises, movements, excerpts, or instruments. Watch the video of my practice journal. Before you start a practice journal, you need to get a notebook you can use. You can use a smaller notebook or a larger one, depending on your preferences. There are many different styles available. You can get a notebook with lines, without lines, or even a dot grid notebook. Choose one that you like and think you will use the most. If you’re intimidated by making your own practice journal, you can find different templates or ideas for journals online. There are plenty of videos of people showing how they use their practice journal. Everyone works differently, so don’t be afraid to experiment until you find your perfect setup. While most musicians would benefit from a practice journal, there are a few exceptions. 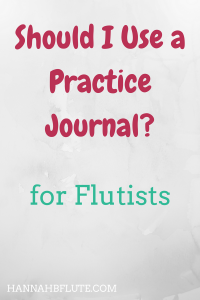 First, beginners shouldn’t use a practice journal, yet. When you are completely new to an instrument, you need to focus on the basics. Learn the fundamentals of your instrument first. You can track your practice later. Another situation where a practice journal could be a hinderance is if you don’t practice every single day. In this case, a practice journal could just cause more anxiety around practicing. If your schedule doesn’t allow for daily practice, a practice journal could make you feel guilty for not practicing or writing in it. The third instance where you might want to avoid a practice journal is after time away from the instrument. Whether that is because of a surgery or other reason, take things slowly at first. If you haven’t played regularly in a while, you shouldn’t overwhelm yourself at first. In all of these cases, a practice journal can come later. As you improve on your instrument or start to practice more, you can create a practice journal. Do you use a practice journal? How do you track your practice? Leave your answer in the comments and be sure to subscribe below for freebies!